MILAN -- Fiat S.p.A. targets a merger with Chrysler Group within the next three years as the U.S. carmaker becomes the driving force behind profits at the Italian company. "There's no single doubt that at some point of time between now and the conclusion of the 2014 plan, we need to find a corporate convergence between Fiat and Chrysler," Sergio Marchionne, CEO of both carmakers, said on a call Friday with analysts. "We are totally open to what the solution is going to yield." Fiat must first reach an agreement with the United Auto Workers on what to do with the 41.5 percent Chrysler stake that the union's retiree health-care trust owns and get in place the necessary financing, Marchionne said, adding that there's no "immediate need" for a merger as there is "a lot of time." Marchionne, 59, aims to combine the carmakers to reduce costs and achieve a target of more than 100 billion euros ($142 billion) in revenue by 2014 as he struggles to end Fiat's European losses, which analysts estimate at 800 million euros a year. Fiat, which owns 53.5 percent of Chrysler, expects to get to 58.5 percent by the end of the year after meeting performance targets set during Chrysler's 2009 bailout. Fiat's biggest shareholder, Exor S.p.A., said in a statement Thursday that both Fiat and Fiat Industrial are proposing to convert preferred and savings shares into common stock. Exor, the Agnelli family investment company whose CEO John Elkann is also Fiat's chairman, said it plans to keep its holdings in Fiat and Fiat Industrial above 30 percent. "If you want to read it as a means of preparing for a potential merger with Chrysler, you read it properly," Marchionne said on Friday's call. "The way in which this happens is totally open but we need to make sure that all the instruments are in place for that to happen relatively quickly." 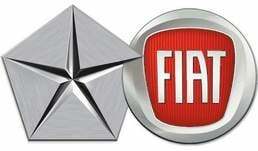 Fiat raised its target for 2011 trading profit to more than 2.1 billion euros on the strength of Chrysler's earnings. Chrysler's third-quarter trading profit contributed 65 percent of overall results. Fiat fully consolidated Chrysler's results for the first time. The carmaker reiterated a forecast for 2011 sales to exceed 58 billion euros. The American carmaker's third-quarter U.S. market share gained 1.8 percentage points to 11.4 percent, the company said Thursday. Fiat's European market share in the period sank 0.6 percentage points to 6.5 percent. "Chrysler is driving earnings," said Emanuele Vizzini, chief investment officer at Investitori Sgr in Milan. "For Fiat, while trading profit is better than expected, revenues are weak as its problems in Italy are emerging." Net industrial debt climbed to 5.8 billion euros from 3.4 billion euros three months earlier, Fiat said Thursday. Industrial cash flow, excluding Chrysler, was a negative 1.41 billion euros. "The real story is the cash burn," said Erich Hauser, a Credit Suisse analyst in London. With the market anticipating net debt at Fiat's industrial operations of 4.1 billion euros, "the poor cash flow during the third quarter highlights just how volatile Fiat's balance sheet has become." Chrysler won't consider an initial public offering until there is more clarity and stability in equity markets, Marchionne said on Friday. "I wouldn't venture to do anything in this market today," he said. "Regardless of how well we perform, I think it's an ungrateful market. It's distracted by a number of other things, some of which may be more relevant than our own issues." Fiat posted a third-quarter net loss of 46 million euros compared with a profit of 170 million euros a year earlier. Profit was burdened by 138 million euros writedown of equity swaps related to stock options and 57 million euros in other one-time charges. Fiat was downgraded one level by Fitch Ratings last week on concern that a combination with Chrysler will increase financial risk for the Italian carmaker. Fiat was lowered to BB, two steps below investment grade, from BB+, Fitch said. The rating company has a negative outlook on the manufacturer. Moody's Investors Service and Standard & Poor's lowered their ratings on Fiat earlier this year, citing concerns that the integration with Chrysler will leave Fiat responsible for the American carmaker's debt.